Most women don’t aspire to be anything like an Italian grandmother, but, after making pesto by hand, I’ve chucked my anti-wrinkle regime and made aprons my favorite fashion accessory. Every summer, Shawn’s got several basil plants growing in the back garden and, so, we make a lot of pesto at home. On busy weeknights, we love it over pasta, a quick dinner that even our picky little nugget loves to eat. Once you make it, you’ll never buy pesto from the store again. It’s so easy, because you just toss everything into the food processor and blitz for a minute. At a recent pasta-making class, I was actually disappointed to see pesto on the to-do list, because I wanted to learn new things. I already had pesto in my pocket. While the instructor slowly drizzled the olive oil over the spinning blades, drop by drop, she told us about her days in the Los Angeles Times test kitchen. 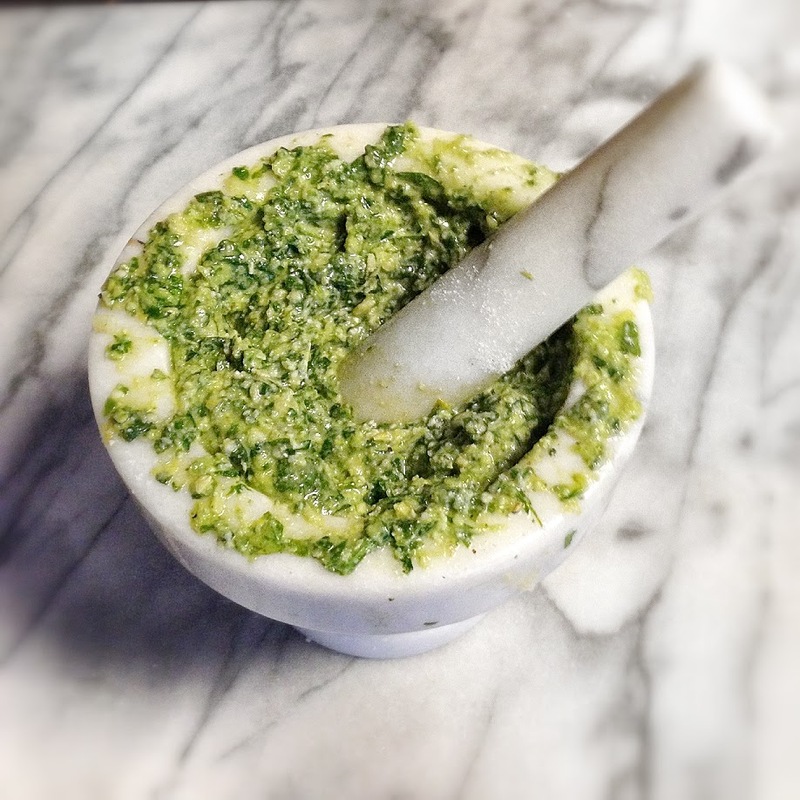 One of the chefs there suggested making pesto by hand in a mortar & pestle (Say what?! ), then doing a blind Pepsi challenge with another batch made quickly in th e blitzer. You know I thought this was just so ridiculous. Why would I give up the luxury of modern technology and the Rolls Royce of food processors that my loving husband had gotten me recently, only to suffer with what could very well be the most barbaric of culinary tools and on purpose? The appeal of making anything like an Italian grandmother is undeniable, at least to me. Fast-forward to yesterday. Our little sweetheart started kindergarten on Monday. Somehow, she is up exactly at 6:30AM, regardless of how late she fell asleep the night before. This is most peculiar and makes mornings are a bit more crazy. One of us packs lunch while the other tries to wake up Sleeping Beauty in time to meet at the breakfast table for some family-time before starting the day. That evening, Shawn took Daisy to karate while I worked on dinner which was going to be a snap – just ready-made tortellini and pesto. Still in my nice work clothes, I wrapped my favorite apron around me and got to work. I went out to the backyard and picked a big bunch of basil. The fragrance of the fresh herbs filled the air. Before I knew it, I had our tiny mortar & pestle out, thrashing, pounding basil leaves against the marble walls. I don’t know what had gotten into me. I was making a royal mess and giggling like a little girl. There were bits of basil, oil and cheese everywhere, the counter-top, the walls, my hands, all over my smiling face. My complexion hasn’t looked more radiant. Next time someone tells you to eat your greens, you’ll be armed and ready. Sure you’ll make a big, fat messy mess, but I guarantee you’ll have a blast making pesto this way and the taste will have you hooked, maybe even render your food processor useless. Nonna would be proud. Remember that “Luddite” doesn’t have to be an insult. It COULD be an aspiration. I have a mortar/pestle made of black palm wood. Makes short work of grinding spices, and a lot easier to clean than the spice grinder. Congratulations on beating the “C”.